Sports is full of oxymorons. An oxymoron is a figure of speech that juxtaposes elements that appear to be contradictory. Team names like the “Fighting Quakers” comes immediately to mind. And for those that don’t know, Quakers are pacifists, meaning they don’t believe in fighting but instead take “turn the other cheek” quite literally. I went to a Quaker school in Philly (so ask me how I know). And saying we “didn’t have a prayer” is certainly an oxymoron, because there is always hope; but you’re gotta have hope in order for there to be hope. Other examples of oxymorons in sports include “boxing ring,” “warming down,” and “forward lateral.” Everyone knows that a boxing “ring” is square, that you warm up when you’re cold, not down, (after a work-out you cool off, but surely I digress) and you can’t go forward and move laterally at the same time. And here’s another one you can add to the list: the Maryland/West Virginia game in the 2015 NCAA Men’s Basketball Tournament last night was pretty ugly. 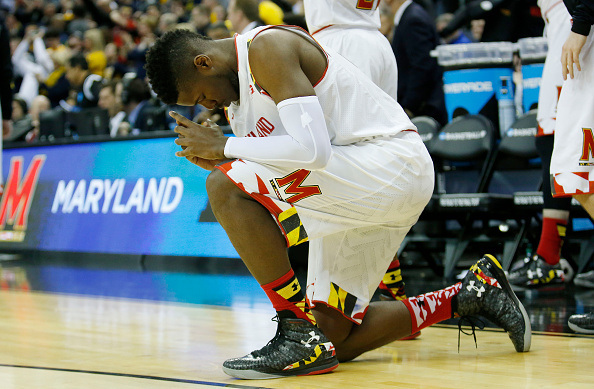 The Maryland Terrapins Men’s Basketball Team had a great season with an awful ending. By most standards and all accounts, the Terps over-achieved and over-reached and over-performed and had a record-setting season; they won a ton of games, but just came up short at the end. Unfortunately, their season did not match their play last night. Last night, oxymorons were everywhere and allusions abounded. The Terps played with sharp dullness and tired energy and sloppy efficiency. They turned the ball over 21 TIMES! Twenty-One times! Seriously? And Melo Trimble got hurt, so any hope of winning went out the door when he went down on the floor. Oh well. But even with Melo the Terps were amazingly unexceptional and happily horrible. Last night was painful and stressful and awful and woeful; on the other hand, the entire length of this all of a sudden short season, a.k.a., the season as a whole, was exciting and exhilarating and thrilling and bone chilling. Go figure. And such is life. In life you learn to take the good with the bad and the ups with the downs and the wins with the losses. You learn to accept the incongruities and the ambiguities of a good team going cold or a bad team getting hot. It’s called living and dying with your team and loving and hating them simultaneously all at the same time. You have to learn to run slow and walk fast and to be nasty with a smile, all at once. So keep your heads up, Terp Fans. Dez Wells and Melo Trimble are the ones that got us to the Big Dance, and you’re supposed to dance with the girl that you got, not the one you’re trying to get. And she’s still our “girl” even though the dance last night was pretty ugly. But with Mello and the rest of the freshman coming back, we’re actually sitting pretty. In sports, there are oodles of oxymorons. There’s crying and amidst and alongside the celebration, because only one team can win the last game of the season. Only one team can walk off of the court and say that they went out on top. And only one team can cut down the nets. So far, Kentucky is still the front-runner, with Duke, Wisconsin, Arizona and Gonzaga all close seconds, nipping at their heels. The thing to remember about Maryland’s season-ending, 69-59 loss to West Virginia on Sunday night wasn’t the final score. It wasn’t the aesthetics, either; West Virginia’s manic style could make the Harlem Globetrotters look sloppy. And it certainly wasn’t the ending — after Melo Trimble was sidelined by two blows to the head, things fell apart, fans in yellow roaring as the typically composed Terps unraveled. No, the moment to remember came in the first half, when the Terps were still streaking up and down the court with a lineup featuring Trimble, Dion Wiley, Jared Nickens and Michal Cekovsky. That’s four freshmen, for those without a lineup card, and it speaks to the lasting emotion of this Maryland season: renewed hope.